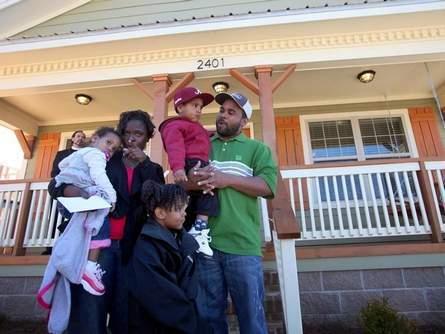 The Hall-Matthews family at dedication of new home Monday. Photo by Dusty Compton of The Tuscaloosa News. Amid the stories of the latest tornado-related losses around the country, two rays of hope: Habitat for Humanity Tuscaloosa has dedicated two homes for tornado survivors in the last five days. Last week Habitat dedicated the home for storm survivor Appie Jones.Monday’s dedication was for the new home of Amie Hall and Keith Matthews; last April’s tornado lifted and moved the entire house with Hall and their three children in it. See the link for more.